Hey folks Valkor and welcome to my CES 2009 headphone blowout. Here we will preview some of the hottest headsets to grace these ears. I’ve never experienced 5.1 surround sound headphones before and I finally got the chance through three great companies who have something special going on. 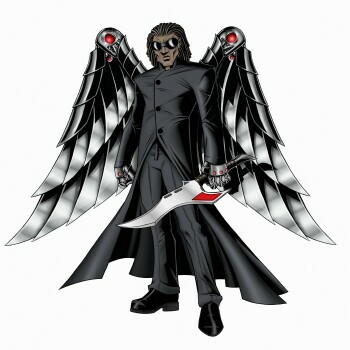 That is until they enter the Val-cave, and then it might be a different story. Until then here’s a sneak peek of what they have to offer. TurtleBeach - I was familiar with the name TurtleBeach from the use of their soundcards in the past, until then I’ve been mostly a Creative guy. However their headphones will have me swaying back in their direction as theirs was the only 5.1 headphones that can truly handle directional sound. I’m talkin sound you can hear all around you. Playing a racing game on the PS3 (name I forget) the cars that were to the left, you can actually hear them coming from behind, then next to you, and when their far ahead of you. For PS3 games gotta go with the PX1, however since the AK-R8 uses USB, you should be able to use that with the PS3 as well. Both come with a mic from chatting while you’re getting pwned… ok that’s just me. Look for a full review in the coming months. Tritton - If TurtleBeach’s headsets offer great sound, then Tritton’s got the look, plus strong sound. 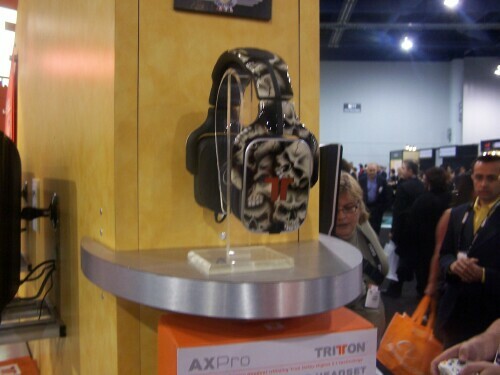 Their AX PRO sounds strong, once the sound levels are check. Upon my first demo, the bass was up too high, but after a quick adjustment… NICE! Plus Tritton offers different looks; The Skull look works perfect for me, though I can go with one with my Val-image. What makes Tritton really stand out is how it handles minute details; I demoed it with COD 4 and what’s cool is that little detail like glass breaking, or shells falling on the ground, you can make out clearly as if you were in the action. Bullets flying, explosions all around you can be heard clearly. It’s scary. I cannot forget to mention the AX Soundbar with Wireless Subwoofer. Talk about packing a punch. I had a chance to experience Sony’s Soundbar and Tritton’s easily blew it away. Strong bass and terrific sound quality, plus different modes of sound for gaming, music and movies completes the package. Dare I say it offers a stronger package than Orbitsound? That remains to be seen, until we do a side by side comparison. 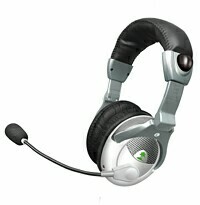 Psyko - TurtleBeach has the sound, Tritton’s got the look, put them together and you get Psyko. This company has the craziest headphones I’ve ever seen and their rep was too funny. When asked about the flaps on the side, he answered “They act as vents for cooling.” But I don’t think the guy was satisfied with the response because he answered again “It’s just vents”. You had to be there. 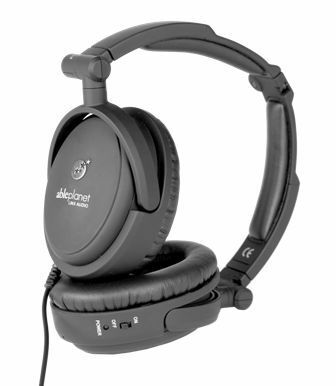 Anywho, Psyko’s headsets feature a unique design, known as PsykoWave, where the five channels line the top and the sub is at the ears, bringing it all together to deliver a sound package that can hang with the best of them. 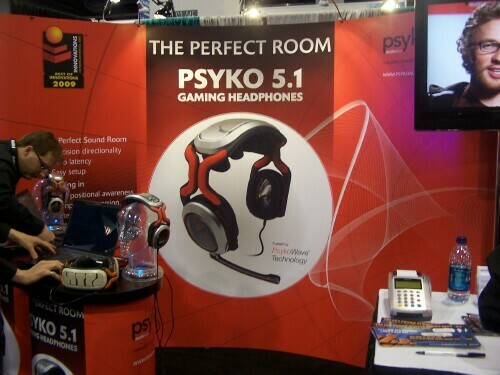 Though I still give TurtleBeach props in the directional sound area, Psyko’s come close to achieving that same experience. Soft in the bass, but great in directional sound, plus that funky design makes Psyko’s headphones a sweet deal! We’ll have more when we get a unit. Ableplanet - I visited Ableplanet last year and it was great hangin out with them again in 09. A couple of years ago I had the chance to test out Bose’s QuietComfort 3 Noise cancelling headphones. Needless to say that for a Bose product I was not impressed, mostly due to the fact that once you turn off the noise cancelling, you pretty much have to put those babies away. With AblePlanet’s Clear Harmony Noise Cancelling, you can keep on rocking well after you turn them off. Plus off or on you’ll get great quality sound. Next up we have AP’s Clear Voice headphones with mic, using LINX audio technology. Taken right from the AP’s website “Able Planet embeds patent-pending LINX AUDIO™ into audio and communication devices to enhance sound quality and speech clarity For All Levels of Hearing.” And believe it or not as I write this, we have a pair of both in the Val-Cave. So in a week or so you will get a full-on review. Stay tuned to the pages of TOV for more on these exciting products, as they arrive at the Val-Cave.